After playing with MSpec on somebody else' machine a couple of weeks ago I decided to give it a try today and tweak it a bit. I worked on the Movie Tickets kata with someone who was not an experienced TDD/BDD-er and this is how far we went. Getting MSpec is pretty easy. Pull the source code from the github repo and build it. 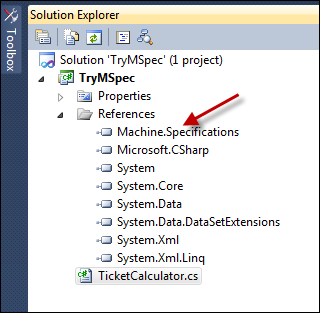 Once you have everything built you should just reference the dll in your C# project: Machine.Specifications. I wanted to keep my solution as simple as possible so I kept both the TicketCalculator and its specs in the same .cs file. Since refactoring in the "red" is forbidden, I did the simplest thing that would make my test to pass: I returned 11 from the "FinishPurchase()" method. I am looking at both the MSpec code and the output and they are ugly: it's really hard to read. To me a test is readable when I can show it to someone and can pretty much tell what's going on in there. My spec passed so I started cleaning up my code. The first thing I did was introducing new aliases for the delegate names. Establish, Because and It felt awkward. I always think about Given-When-Then state transitions in my tests and this change just felt more natural to me. I don't have much space on this page, but if you indent the lambda a little more the Given - When - Then words will become more apparent. Let's look at the second scenario: a standard movie ticket for a student is $8. Notice we have duplication in our specs: the "Given" delegate is duplicated the exact same way in both of them. Time to DRY up the code a little bit. I created a base class called SpecBase and moved the field "_calculator" and the "Given" delegate into it. This way the spec is short and there is no duplication, however, I don't see the "Given" part in it. I took care of it by renaming the "SpecBase" class to "Given_i_buy_a_standard_ticket" and with the right indentation I should have a readable spec that tells a story. You can find the final C# file in this gist: http://gist.github.com/576433. the spec tells you a story.